Jackie (left) and Damien (right) posing for their first picture as a married couple. On February 14, at doggie day care Hounds Town USA on Commack Road, two dogs promised to love, honor, and sniff each other for the rest of their lives. Witnessed by their pack friends, Jackie and Damien are proof that true love cannot be leashed. Jackie is a mixed breed mutt that was rescued from Puerto Rico in 2015. Part Jack Russell, part beagle, and part chihuahua, she was afraid of almost everything when she first arrived from storm-riddled Puerto Rico. As Hounds Town – Commack Rd. owner Teri puts it, “Jackie used to spend most of her day pressed up against the wall.” But after taking some obedience classes and adjusting to life in a loving new home, Jackie began to shine. That’s when she met Damien. After passing her Canine Good Citizen Test, Jackie moved into an AKC Trick Dogs class. and into the open paws of a sleek Doberman Pinscher named Damien. With a Rally title behind him, Damien was too pawfect to resist. It began with off-leash play dates. Then agility class date nights. Finally, Damien popped the question. Love is in the air for the happy couple. 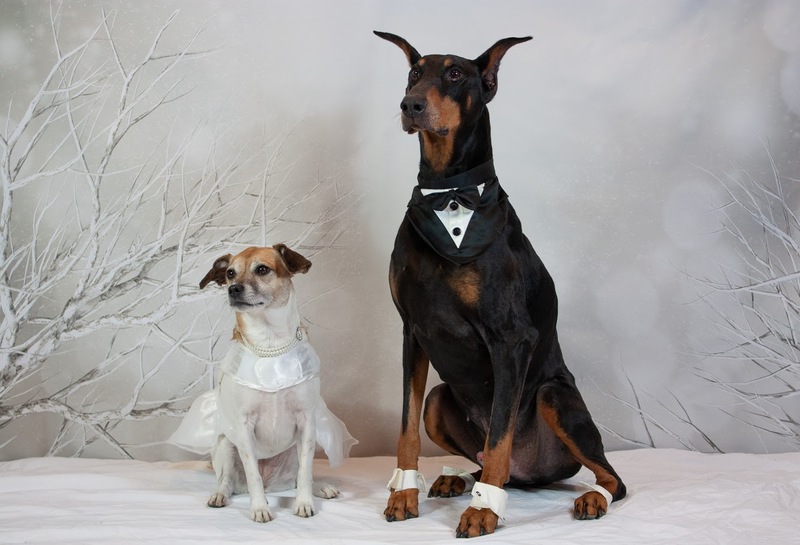 Paisley, the Dog of Honor, is Jackie’s best bud. With the help of Paisley, Jackie’s best friend, Jackie found a stunning custom gown from Etsy. She even treated Paisley to a matching lavender bandana with “Dog of Honor” inscribed on it. Damien, always practical, sported a sharp tux from Petco. The food was delicious, and the open bar was loaded up with “Cosmuttpolitans” and “Heinesniffins” for their hungry pup guests. And even though they were working, pup parents everywhere followed along on social media to cheer on the canine couple. Keep following Jackie and Damien’s love story on Hounds Town USA and be sure and follow Hounds Town Commack Road on Facebook and Instagram (@houndstowncommackrd) for more great photos!